Sangwaiya, A., Gill, M., Bairwa, S., Chaudhry, M., Sen, R., Prakash Kataria, S. (2018). Utility of P16/INK4a and Ki-67 in Preneoplasticand Neoplastic Lesions of Cervix. 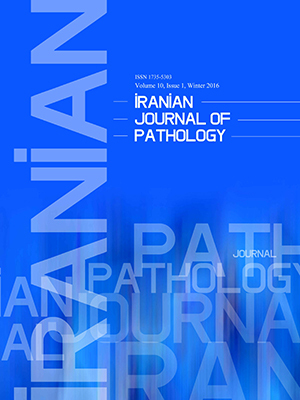 Iranian Journal of Pathology, 13(3), 308-316. Ashok Sangwaiya; Meenu Gill; Shilpa Bairwa; Manish Chaudhry; Rajeev Sen; Sant Prakash Kataria. "Utility of P16/INK4a and Ki-67 in Preneoplasticand Neoplastic Lesions of Cervix". Iranian Journal of Pathology, 13, 3, 2018, 308-316. Sangwaiya, A., Gill, M., Bairwa, S., Chaudhry, M., Sen, R., Prakash Kataria, S. (2018). 'Utility of P16/INK4a and Ki-67 in Preneoplasticand Neoplastic Lesions of Cervix', Iranian Journal of Pathology, 13(3), pp. 308-316. Sangwaiya, A., Gill, M., Bairwa, S., Chaudhry, M., Sen, R., Prakash Kataria, S. Utility of P16/INK4a and Ki-67 in Preneoplasticand Neoplastic Lesions of Cervix. Iranian Journal of Pathology, 2018; 13(3): 308-316. Background and Objective: The currentstudy aimed at investigating the histomorphological spectrum of cervical intraepithelial and invasive lesions assessing the diagnostic significance of P16/INK4a and Ki-67 in such lesions, andcorrelatingP16/INK4a and Ki-67 immunoexpression with histologic type and grade. Methods: A total of 60 cases were selectedcomprising 10 cases withchronic cervicitis, 29 cases withcervical intraepithelial neoplasia(CIN), and 21 cases withsquamous cell carcinoma. These cases were evaluated morphologically and immunohistochemically with P16 and Ki-67. Results: There was no expression of P16 and Ki-67 in 10 (100%) cases withchronic cervicitis while in CIN, it was expressed in 25 (86.20%) cases and in carcinoma it was expressed in 20 (95.23%) cases. Ki-67 was expressed in 28 (96.55%) cases withCIN and in 100% of cases withcarcinoma. Conclusion: Cervical carcinoma is a significant contributor to cancer-related morbidity and mortality worldwide. Identification of bio-markers in cervical neoplasia is necessary to distinguish CIN from other non-neoplastic cervical lesions to prevent under treatmentor overtreatment as the histomorphological features alone are not sufficient.Significant upregulation of P16, cyclin dependent kinase inhibitor, and Ki-67, a nuclear non-histone protein, was observed in carcinoma cervix and with the increasing severity of CINs. Correlation between grades of P16 and Ki-67 among cervical pre-neoplasia and neoplasia showed an increasing P16 expression with consistently increasing Ki-67 labelling index in the groups with theincreasing severity. The incidence of carcinoma cervix has declined by two-thirds in the past 40 years in the western world. However it remains the major cause of deathin femalesin the developing countries including India. Pap smear test is subjected to suboptimal sensitivity, limited reproducibility, and many times with high rate of false positive and false negative, along with equivocal results. To compensate for the aforementioned deficiencies, a screening program with repeated testing, and follow-up of positive cases is warranted. Moreover, colposcopicbiopsy is directed in any suspicious case. Thesurgical intervention is unnecessary in such patients. Since human papillomavirus (HPV) disrupts the normal cell cycle, leading to cell death, a number of genes/proteins are deregulated;thereby, such genes/proteins can be used as surrogate diagnostic markers. Identification of biomarkers in cervical neoplasia is necessary to distinguish cervical intraepithelial neoplasia (CIN) from other non-neoplastic cervical lesions to prevent under treatmentor overtreatment. Two markers that showeda potential in this direction are P16/INK4a and Ki67. Correlation between grades of P16 and Ki67 among cervical pre-neoplasia and neoplasia showed an increasing P16 expression with consistently increasing Ki67labelling index in the groups withincreasing severity.